Famed film director Quentin Tarantino did not walk back any of his comments regarding police killings despite persistent rumors he would apologize publicly in the face of boycott threats by police unions. “What I said was the truth,” he said. Ten days after making brief remarks at an anti-police brutality march, Tarantino gave The Los Angeles Times his first public statement. "All cops are not murderers. I never said that. I never even implied that,” said the director of Django Unchained. 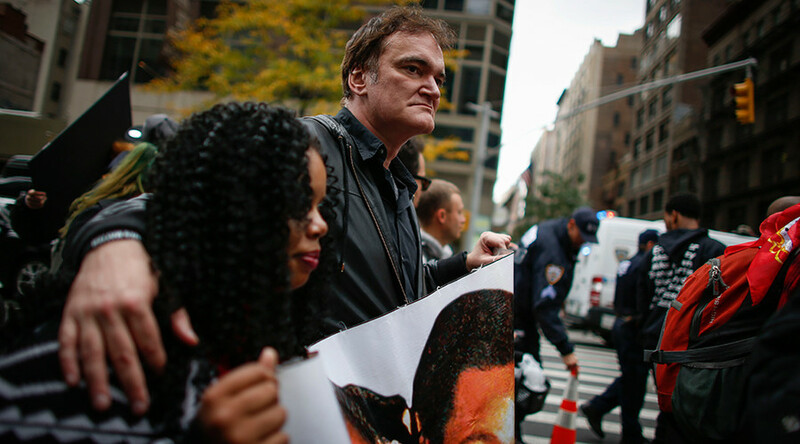 Taking part in the Rise Up October protest against police brutality, in New York City’s Washington Square Park on October 24, Tarantino told the crowd: "I wanna give my time to the families, however, I do just wanna say, what am I doin' here? I'm doin' here, because I am a human being with a conscience. And when I see murder, I cannot stand by, and I have to call the murdered the murdered, and I have to call the murderers the murderers. Now I wanna give my time to the families. Thank you very much." The National Association of Police Officers, a lobbying organization representing 241,000 law enforcement officers and over 2,000 police units, as well as 11,000 retired cops and some 100,000 others indirectly associated individuals, took offense to the “murderers” characterization. Police unions in New York, New Jersey, Philadelphia, Chicago, Houston, Los Angeles, Orange County, and San Jose have joined in the call to boycott Tarantino’s upcoming film The Hateful Eight, and are encouraging members to turn down security service positions offered for Tarantino’s projects. The National Border Patrol Council has answered the call as well. "What they’re doing is pretty obvious," Tarantino told the LA Times. "Instead of dealing with the incidents of police brutality that those people were bringing up, instead of examining the problem of police brutality in this country, better they single me out. And their message is very clear. It’s to shut me down. It’s to discredit me. It is to intimidate me. It is to shut my mouth, and even more important than that, it is to send a message out to any other prominent person that might feel the need to join that side of the argument." Tarantino referred to Rice, Brown and Boyd as “the murdered,” a remark deemed insensitive by Los Angeles Police Dept. Lt. Craig Lally, who is also head of the Police Protective League. "There's an underground of people who are very pro-police, and you don't hear about them until they get pissed off," Lally told the LA Times. "And it's going to be this underground that shuts down [The Hateful Eight], not the cops." Lally noted that four days prior to the rally, Randolph Holder, a 33-year-old Guyanese immigrant and NYPD officer, was shot while on duty. "I'm not being intimidated. Frankly, it feels lousy to have a bunch of police mouthpieces call me a cop hater. I'm not a cop hater. That is a misrepresentation. That is slanderous. That is not how I feel. But you know, that's their choice to do that to me. What can I do? I'm not taking back what I said,” Tarantino told the newspaper. Tarantino is scheduled to appear on HBO’s "Real Time with Bill Maher" on Tuesday evening, with other guests Keith Olbermann, David Frum, Anthony Weiner, and Jillian Melchior. He is also being touted by MSNBC’s Chris Hayes as his guest for Wednesday’s show. A police boycott may not be Tarantino’s biggest problem. The Hateful Eight opens on Christmas, up against The Revenant with Leonardo DiCaprio and Joy, starring Jennifer Lawrence. Star Wars: Episode VII opens the week before, but will undoubtedly remain tough competition for Tarantino’s less-promoted movie.